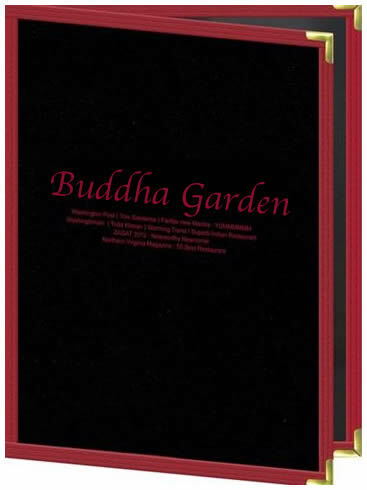 Delight Hardback Clear Pocket Menu Covers.. The world boasts contrast.. & here's a menu cover with artful contrast. Think outside the color wheel, & do something different. DELIGHT menu covers are NEW.. & they do more but cost less. 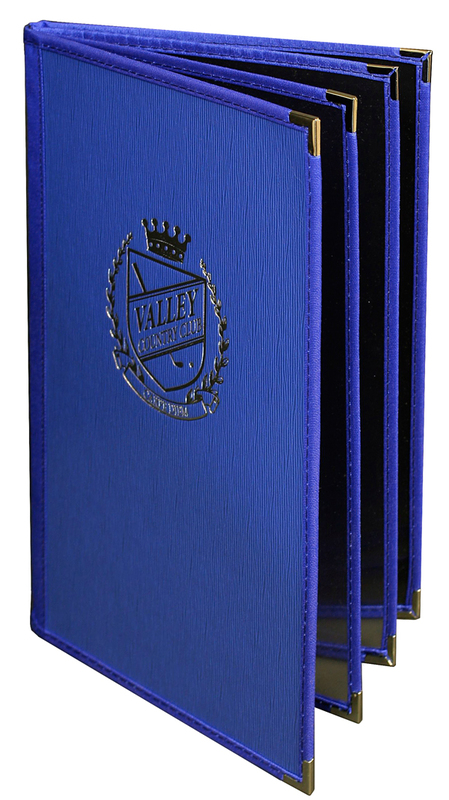 You'll choose a cover or 'face' material, as well as a binding edge color. It can be a subtle or bold contrast- your choice. 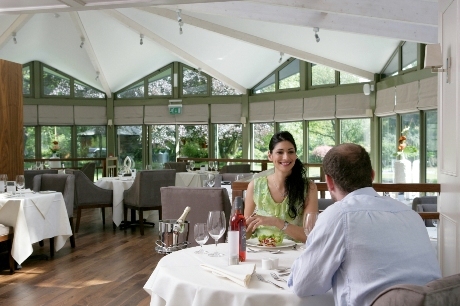 This innovative menu cover could be just right for your restaurant! 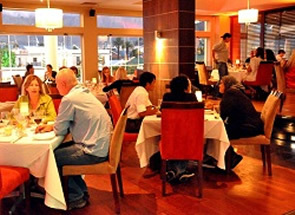 Delight offers you a wide variety of finishes so that your menu covers will have a unique & non-cookie-cutter appearance. 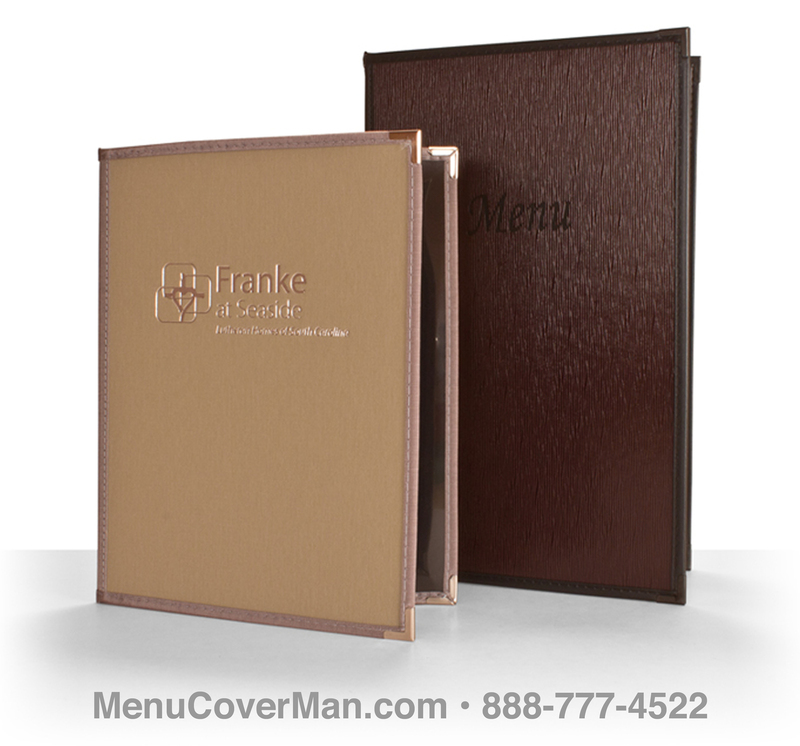 Your new menu covers will stand out & be noticed. Plus+ they will bear your imprint on higher quality Bistro or Oakmont materials, & look just plain great. 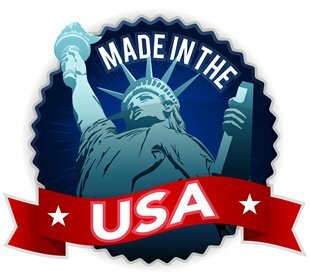 Superior materials & made-in-USA quality workmanship equal long service life, excellence & satisfaction. Delight features clear insertable interior pockets- there are no album-style corners. That's where the value & savings come in. Imagine all the creative possibilities! and all the Binding Colors and Face materials. Bistro or Oakmont materials can be beautifully stamped with your logo or typeset name in Gold, Silver or Black foil! Custom imprinting, in one foil color, is absolutely FREE for 25+ orders. Don't have art? We'll design it for you for FREE! Smooth gold corners are standard- silver corners upon request. Your actual menu insert would appear in a clear pocket on the other side. Delight features clear insertable pockets- there are no album-style corners. That's where the savings come in! 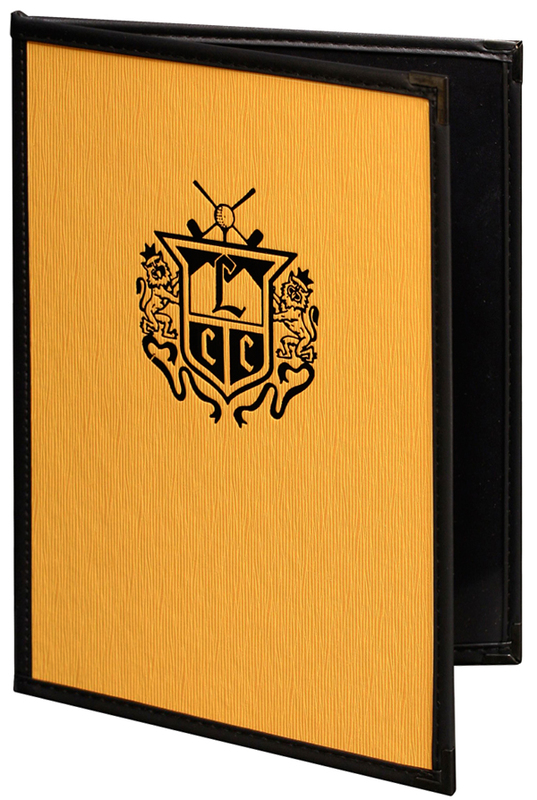 Important: Please select both a Binding Color and a Face Material, and then click "Add to Cart"
Bistro or Oakmont materials on front & back cover- the front can be beautifully stamped with your logo or typeset name in Gold, Silver or Black foil! 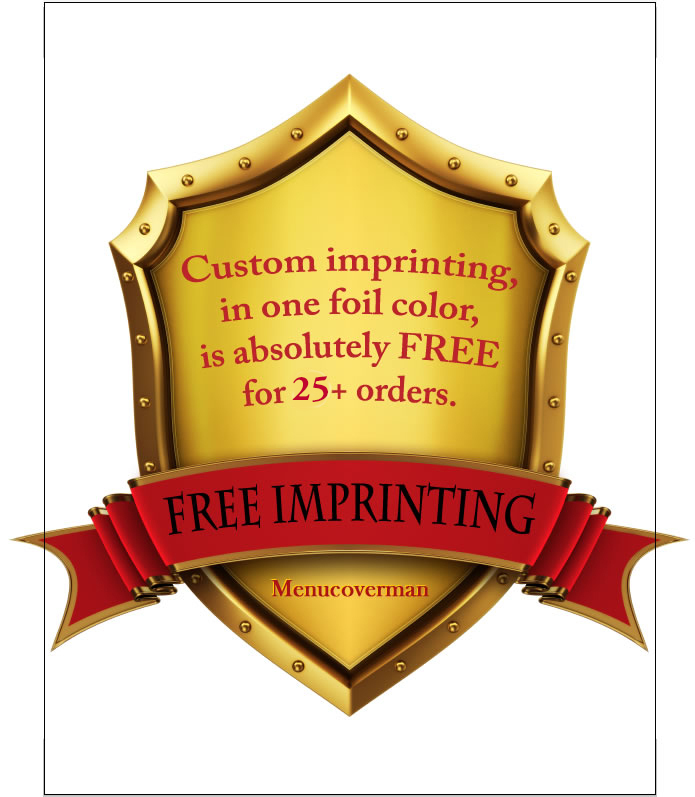 Custom imprinting, in one foil color, is absolutely FREE for 25+ orders. Don't have art? We'll design it for you for FREE! Smooth gold corners are standard- silver corners upon request. 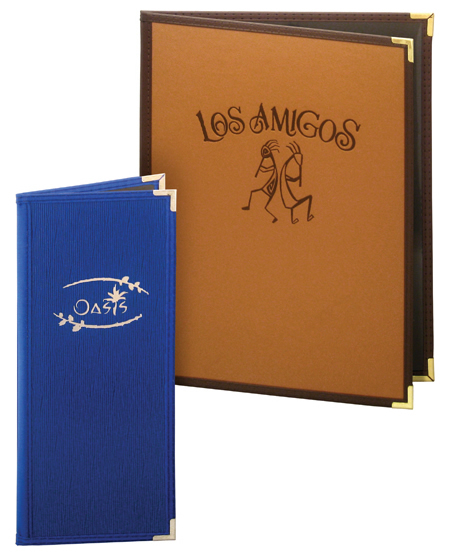 Your own actual menu inserts will slide into the clear pockets on the inside. Delight features clear insertable pockets on the inside- there are no album-style corners. That's where the savings come in! Bistro or Oakmont materials on front. Back cover is clear!! 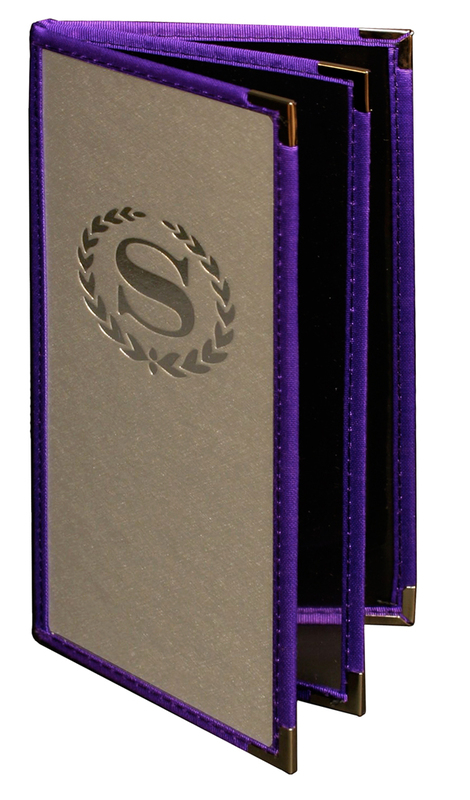 The front can be beautifully stamped with your logo or typeset name in Gold, Silver or Black foil! Custom imprinting, in one foil color, is absolutely FREE for 25+ orders. Don't have art? We'll design it for you for FREE! Smooth gold corners are standard- silver corners upon request. IMPORTANT NOTE: THIS MENU COVER'S BACK IS NOT MATERIAL, BUT CLEAR, FOR DISPLAYING THE LAST PAGE OF YOUR MENU FACING OUTWARD. If you want a finished material back cover, then please scroll up to the section immediately above this one. Bistro or Oakmont materials on one front and two back covers. Front can be beautifully stamped with your logo or typeset name in Gold, Silver or Black foil! Custom imprinting, in one foil color, is absolutely FREE for 25+ orders. Don't have art? We'll design it for you for FREE! Smooth gold corners are standard- silver corners upon request. Your own actual menu inserts will slide into the clear pockets on the inside. Delight features clear insertable pockets- there are no album-style corners. That's where the savings come in! 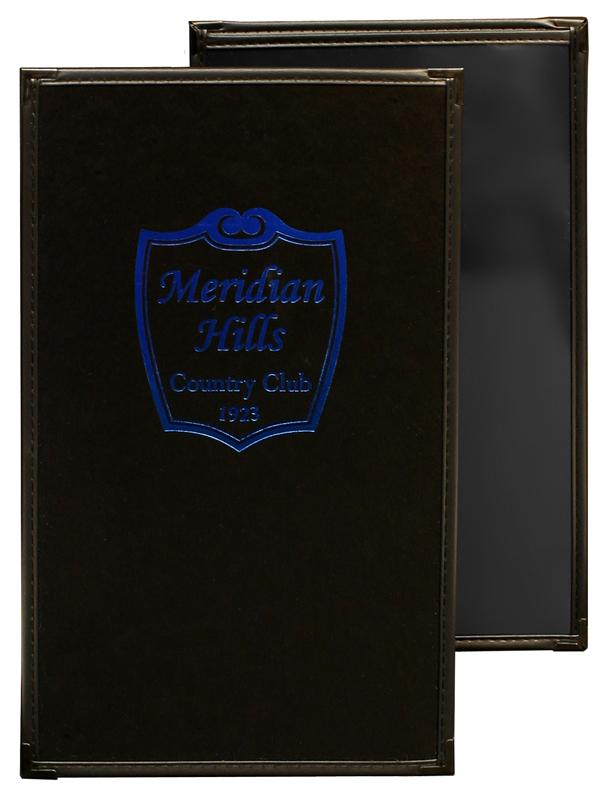 Bistro or Oakmont materials on front & back cover- the front cover can be beautifully stamped with your logo or typeset name in Gold, Silver or Black foil! Custom imprinting, in one foil color, is absolutely FREE for 25+ orders. Don't have art? We'll design it for you for FREE!